On a sunny Sunday i did some special research: i conquered a river close to Hamburg called Este. We drove a little while by car out of the city and passed yellow-blossomed canola fields and i interviewed Carsten of his latest trip to Iceland fly fishing. After 5 mins i nearly got the travel bug to return there soon because Iceland is one of my favourite places to travel, until i discovered NZ last year!! As we arrived at the river not far from the city i straight away noticed it was located in a beautiful valley surrounded by the German country side. We started wandering downstream and it didn´t take long and Carsten hooked his first brownie on a small nymph and it was to be the first of two, they were so beautiful. Maybe he would have caught a few more if he was using some of Stu´s Superior Flies - i teased him. I was quite nervous and excited when he hooked both trout and nearly dropped my camera into the river! - maybe i should have bought a waterproof one!! I should have listened! We were wandering further downstream, it was a perfect spring evening and i learnt a lot about fly fishing, rivers and insects like these little black beetles that must have been on the trouts menu after they had finished bonking? These " black love-beetles" remind me of the Bionic Water Beetles i was selling this year in Stu`s fly shop. I now realise how realistic some of Stu's fly designs are even to my eyes, let alone the trout! Soon after some walkers let their dog swim in the river, it seemed like it was game over for today as the trout did not seem to want to play with the dogs in the water - bugger! We had a break and i was amazed how clear the water was, i did not expected it to be so clear not far from the huge city. After a few hours we made it back to the car, i thought about buying some special sunglasses to prevent myself from spotting wood & stones instead of fish and i´d like to thank Carsten - it was a great day! But before even thinking of fly fishing i should better improve my casting skills as there were many trees around top catch at this river - better i best start where there are no trees- i ask my self. 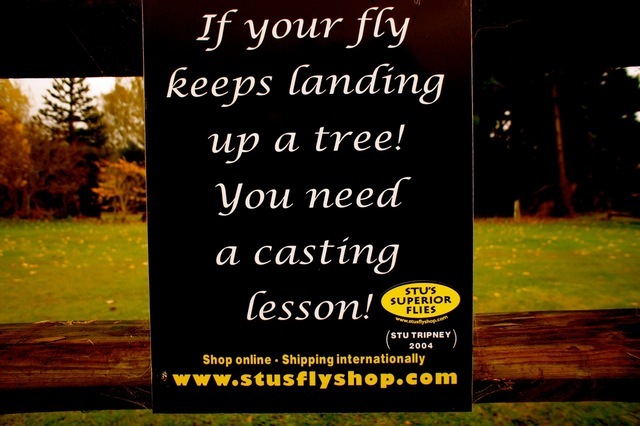 Hiring Stu seems to be quite a good idea, but hopefully i can wrangle to sit in a few more of his casting lessons or NZ fly schools again next year as yes - i have been invited back to slave behind the counter- maybe with George!! I now know why he got this sign made up that is on the fence in the fly shop car park. That´s it from the newbie for now, i´m off on my holidays soon. Maybe i will give you a report about anything fishy i find along my way back to NZ. Ela - Founding Member Of The Famous Fun Dreamteam! 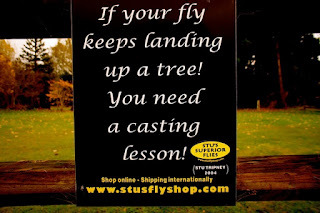 Remember that Stu´s Fly Shop will be closing on the 14th of May so best get your orders in now and support the passion - or wait until next September!